We pride ourselves in providing a good customer experience, by producing high quality furniture and working with our customers to achieve the ultimate product and design they require. We receive many comments about the quality of our products and level of service we provide. The following are a few examples. 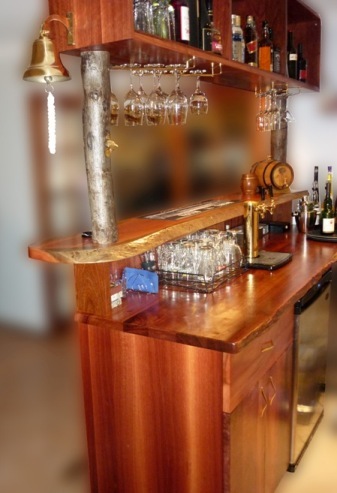 ‘Now there’s a bar – this jarrah is beautiful! It is a real feature. 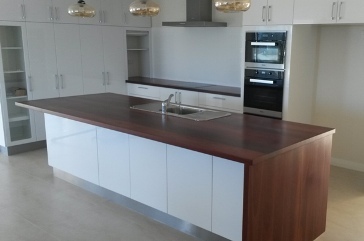 Loved the materials you chose … the beautiful jarrah wood features. Rich use of timber. 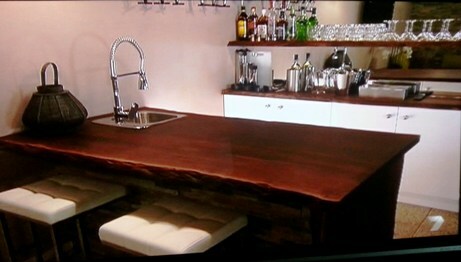 The use of jarrah on the bench and overhead was fantastic, but the master stroke was using jarrah to create the spa bar as well’. The bench tops and shelves used by Adam and Lisa in their renovation for the grand final of House Rules 2014 were manufactured and supplied by NE Timber Benchtops. We would like to thank you for the perfect end result. We are ecstatic – we made the perfect choice – with your exquisite workmanship and your easy working relations we are very proud. I would like to take the opportunity to thank you for a great job on the building of my bar. The workmanship has been of the highest quality, you came in exactly on budget and what was quoted, and you built it in a time frame that was tight but you did it. Many thanks for your hard work and I would highly recommend you to any new or prospective customer. Hey Cameron, I just wanted to drop you a note for your BRILLIANT work at our place. I got home from Oman on Saturday and had a chance to see everything installed. The benches and shelves look absolutely amazing! I love them. You are a genius. We are absolutely delighted with the finished product, It is awesome!!!!!! We love it so much we are going to also purchase a kitchen table & maybe chairs in the next 6 months. We absolutely love it and can’t wait to show our friends on Saturday night when we have a BBQ. Very great experience with you guys & friendly too, means we want to give our money to you guys. We will recommend you guys to all our friends. In following up on our long term dream for quality jarrah furniture, we took our time and looked at various displays around Perth. 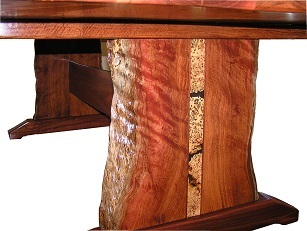 Given our awareness of Cameron Whan’s integrity, we decided to place our trust in Natural Edge Fine Furniture Designs, particularly since he offered to make furniture to our own design – in fact he provided us with a very broad range of options, including natural edge and traditional style Churchman dining suite manufactured by NE Fine Furniture. 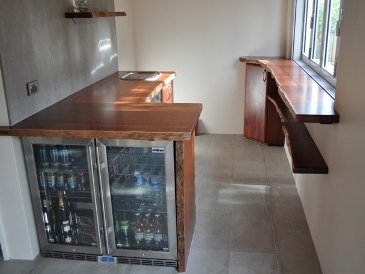 Our first option was a four door/three drawer jarrah bureau in which we were able to choose every aspect of the design. We were immediately struck with the high quality of the work. This was a wonderfully constructed item made completely out of jarrah. Even the rear panels (normally out of sight- therefore our of mind) were solid jarrah. We were convinced that Cameron would be the one to build our dream dining room suite. What followed was a long period of consultation between us regarding the natural edge design of the table, chairs and coffee table. The chairs were of a design not tackled by Cameron before, but he willingly accepted the challenge, and sourced some high quality leather for the seats. He made a prototype of one of the chairs and invited us to sit in it to make comments. What really blew us away was that the eventual suite was crafted entirely out of one tree. This tree, which was located near our previous residence in Roleystone, was collected and milled by Cameron himself. This one tree provided the table, chairs, coffee table, coasters and a picture frame. The challenge we present to our visitors is to try and find the joins in the table tops. They can’t. We have no hesitation in recommending Cameron Whan and Natural Edge Furniture to anyone looking for the personal touch rather than assembly line furniture. We now have our dream dining room, which not only gives us enormous pleasure, but will undoubtedly become an heirloom down through future generations. 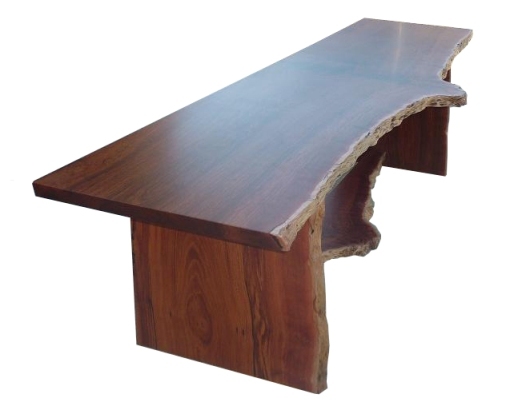 We approached Cameron of Natural Edge in relation to a solid jarrah natural edge dining table. After looking around at many different tables, Cameron was by far the most approachable, offered us many valuable suggestions and was able to meet our exact needs. Cameron custom made a 2600 x 1300 solid jarrah dining table with inlay which is the most fabulous table that we have ever seen. It is of exceptional quality and Cameron was an absolute pleasure to deal with. Cameron also offered us a much better price than any other place that we looked at. So we ended up with exactly what we wanted, with the best quality craftsmanship and at the best price. We would definitely recommend Natural Edge to others!